Necco conversation hearts are once again available in the classic flavors. 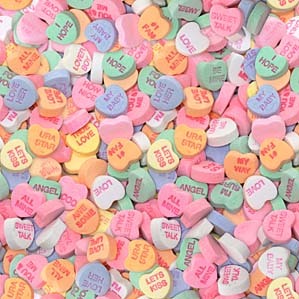 A few years ago the original flavors of the Necco conversation hearts were discontinued and new flavors brought out. The originals were missed by many. Why were they discontinued is a question we are asked by many of our customers. The answer to that question is a bit puzzling . Apparently they came out with new flavors to appeal to the kids. No long could you get the banana and lime, they were replaced with lemon and blue raspberry. The only way you could get the original flavors was to buy them in a 50 pound bulk box. Now I know many customers love the classic flavors, but not to many want 50 pounds. We found a company that repackaged them under their name, but they are the original classic flavors of the Necco brand hearts. For the last couple of years we have been ordering them for this company and hold our breath until our order arrives. I am like most people and like the originals not the new flavors. As soon as our order arrives I have to rip open and bag and do a taste test. Once again this year my mouth was quite happy to taste the banana and lime flavor hearts. Many ask, How can we tell if we are getting the classic or the new flavors ? That is easy check the colors of the hearts if you see blue then you are getting the new flavors. Necco classic flavors are : Banana, Lime, Grape, Cherry, Orange and Wintergreen. I do somewhat understand that the candy companies of course want flavors that appeal to kids, however what they also need to understand is that adults eat a lot of candy as well. Many times the old time candies are bought not just because they are liked, but also for the memories of their youth. Buy Necco Classic Conversation Hearts now if they are a favorite of yours, as we never know from one year to the next if we are going to be able to get them again. When it comes to Valentine candy there a so many choices available. Of course everything is heart shaped and comes in mostly cinnamon and cherry flavors. So many choices , so many new candies coming out every year. Even though there are a lot of new candies that appear on the shelves every year many still like the classic Valentine candies that have been around for years. 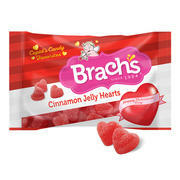 One of our top selling sweet treats for Valentines day is Brach's cinnamon hearts. I am sure everyone has eaten this a time or two and is still a favorite of many. How can you resist the cinnamon flavored jelly heart covered lightly with a sugar coating, giving it just the right combination of a sweet and spicy candy. Not only are Brach's cinnamon jelly hearts great to put in your candy dish or eat right out of the bag, they are also perfect to add to your cupcakes and other treats you bake for Valentine's day. If you like the spicier things in life these are a must have treat. Each bag is 12 oz. and has approximately 45 hearts. Hurry and get yours today as they sell out really quick.